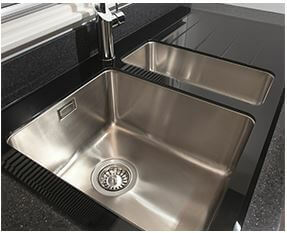 CDA sinks are perfect for any home kitchen. They’re high quality and long-lasting. 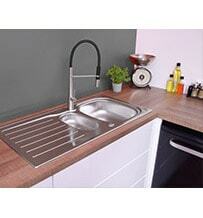 Our kitchen sinks come in a variety of different shapes and styles to suit your kitchen. One size does not fit all so we have created a varied kitchen sink collection. 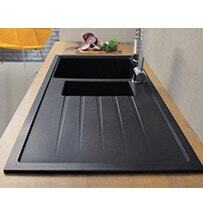 Choose from sink models with draining boards and those without, in modern and traditional styles. Additional accessories like waste disposal units are available too. 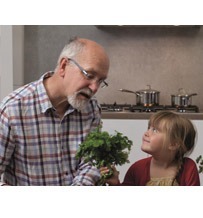 Compact plumbing packs will help the installation go smoothly and make the most of kitchen space, design and function. Our kitchen sinks come in a range of materials. We’ve upgraded traditional stainless-steel sinks to become a statement piece in the kitchen. The composite sink models come in a variety of colours. Hygienic nanoparticles are built into the material to provide anti-bacterial protection. Every sink in the range is built to last. 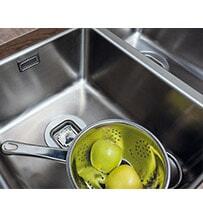 Stainless steel sinks are high grade, scratch, stain and heat-resistant. Composite sinks are virtually indestructible. Our handmade, fireclay ceramic designs are sturdy too. Undermount sinks are growing in popularity in modern homes. These sinks sit below the surface countertop, hanging underneath the counter rather than sitting on top of it. 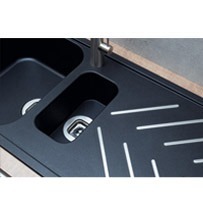 This creates a seamless flow around your kitchen with the sink discreetly fitted within. 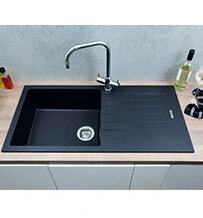 Finally, we have our range of glass sinks made from black tempered glass. 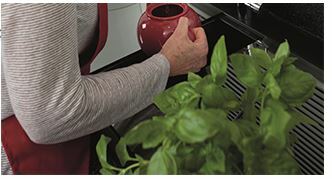 Our stylish glass sinks are resistant to scratches, stains and heat. The perfect update to your modern kitchen. As well as a range of materials to choose from there are different sink sizes to suit every household. A single bowl sink model is ideal for smaller kitchens. A bowl and a half will give you extra draining space. A full double bowl sink allows enough space to wash, rinse and drain simultaneously. Choose the sink size that works for you. 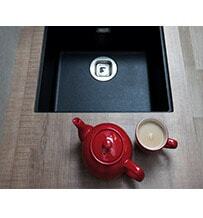 Choosing a sink material goes beyond the colour and design of your kitchen. Think about how hardwearing you need it to be and consider the style of tap you’d like to choose. To help you make the right decision we have prepared a sink material buying guide. Check it out to debunk common sink myths and understand the benefits of each style of sink material. To help keep your new sink as clean as possible we have also collated all our top hints and tips on sink cleaning and hygiene. Whichever model you choose you can rest assured that a CDA sink is built for everyday life and built to last. Sinks come in all shapes, sizes and materials, from glass to composite sinks CDA have you covered. But what do all these terms mean? What is a composite sink? What about undermount sinks? And what sink styles can you choose? Check out our handy guides to brush up on your sink knowledge.